It's almost spring in the US. I saw your tattoo. Awesome. I'm excited for Spring, like dying for it to come. Not so excited about the spring cleaning. What I'm good at: keeping my mouth shut. Something silly: I'd rather walk around talking with a British accent than with my own regular way of talking. The hubby finds it truly annoying. As a Brit, so would I. Not sure where you are, but its not spring all over the States yet. Certainly isn't in Ontario either. I am looking forward to it as well. Had enough winter this year. Don't really do silly any more. Hi Sharon .. well you'll guess my first and second ones ... writing letters and communicating or introducing people to each other. Crazy sillies - I'm not good at those ...but I do love good repartee and making blogging friends laugh ..
Love the fake tattoo. 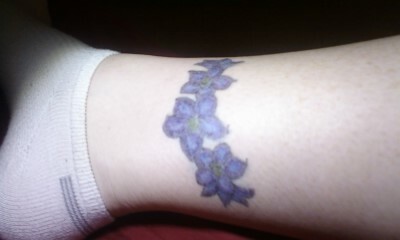 I had a rose once on my ankle and the folks at work were shocked! Let's see- three things I'm good at? I am good at cleaning up. My husband thinks that I have too much energy. It is just that I like the results. I love to organize closets according ot season. Working in clothing/ fashion industry made me finical. I am silly when it comes to singing for my grand kids. When my grandson misses me, my son puts him on the phone so I can sing silly songs to him. Spring cleaning is something I'm not good at, but it's time to start thinking about it. I guess judging from other's comments, it's safe to say I'm good at writing poetry! Also a good listener. I do silly things all the time because of my forgetfulness, but I can't remember what they are! Have a great week, Sharon! I'm good at keeping secrets. Wish other people were too! It is so un-spring like here in Saskatchewan that I can not even begin to think about spring my friend! If I had to list all the silly things I do, I would be here all day. LOL! Love the fake tattoo! And Spring! So glad it's here! Apologies that my human hasn't visited your blog recently. Guess that leaves it up to me. Ah yes, good stuff you mention in regards to spring. We await for the imminent arrival in Britain. In the meantime, it's cold and such a lot of rain. So much rain that the wee folks in our magical garden were wearing life jackets. Yes, I'm sharing your posting on 'Farcebook'! Something silly about me? Okay, I've seen to have turned into a Dr. Seuss alternative with a dash of Willie Shakespeare. we're heading into Autumn here in Oz... yay! I like the cooler weather. Spring attacked me last week. So much to do outside now that the garden's begging for attention again. I love this time of year, so I'm not complaining, just stating fact.